While setting your shopping cart system, you have surely met some predefined drop-down lists such as a list of currencies or languages supported on your site. With ViArt Shop you can customize your online shop by editing all of them. Actually, the section contains a number of tables with predefined values used in different parts of the system. Most of them are very simple and shouldn't cause any difficulties. Product types are used when adding a new product. For more information see section 5.3.2. Manufactures are used when adding a new product; note that you can leave the 'Affiliate Code' field blank. For more information see section 5.4.2. Countries are used when providing customer's personal or delivery details (for more information see section 8.2.2). Note that you can set up country order (defines the sequence of countries in drop-down lists) and default currency (will be used for customers from this country). States are used if USA is selected. Credit Cards Types, Switch & Solo Issue Numbers, Credit Card Expiry Year and Credit Card Start Year are used when providing credit card details. For more information see section 4.2.1.2. Shipping Times and Shipping Rules are used when setting up product shipping options. For more information see section 5.4.2. Release Types and Change Types are used when adding a product release. For more information see section 5.4.10. Currencies define currencies that can be used on the site. Note that you can set the currency default as well as fix an exchange rate and a right/left symbol. The currencies have an additional option that should be used for daily updating the currency rate. 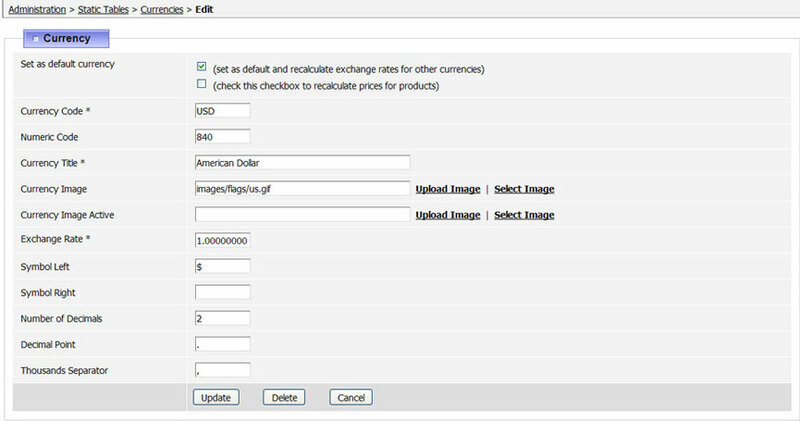 Click the link 'Update from currencysource.com' next to Add New Currency link and the link will update the currency rate. It is possible to set a script to run automatically every day to update your currency rates or alternatively you can do it manually by pressing the link. Companies are used when providing customer's personal details and allows keeping general information such as company name, logo, address, etc. Note that it will be displayed only in this section. For more information see section 8.2.2. Languages define languages that can be used on the site. Note that you can set the language sequence in the drop-down lists via language order. Keep in mind the ability to change the navigation images depending on the language used (see section 3.4.3). For more information about editing messages see section 12.6.